SPACE Collection unpacks a part of its collection at the Elisabeth Strouven Foundation (Abstraat 3) in Maastricht from 02.02.18 to 25.05.18. You are invited to the opening at the foundation on February 2nd from 5pm. On the occasion of this meeting, Marcel Schumacher, director of the Kunsthaus NRW in Kornelimünster, will make an introductory presentation of the exhibition and will discuss the potential of art as a vector of exchange and collaboration at 18:00. 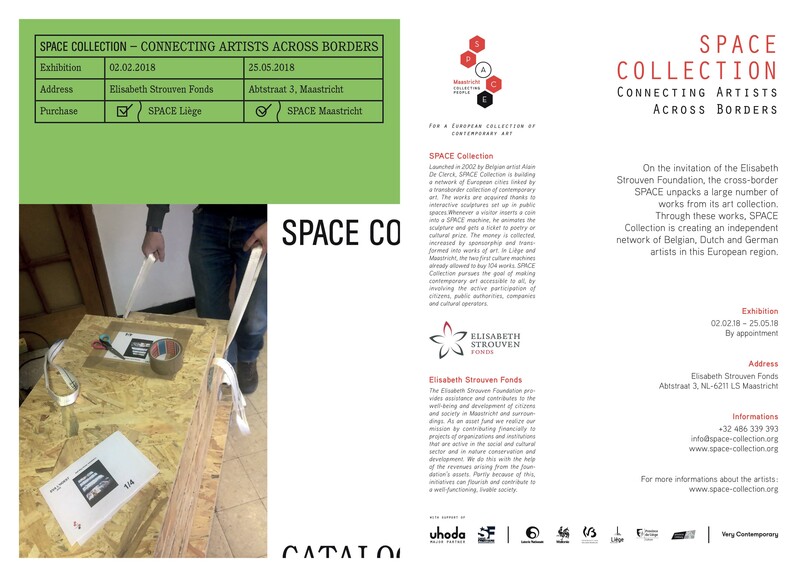 SPACE and Elisabeth Strouven Foundation intend, not only to promote the creation of the Euregional creation, but also to be the initiators of meetings between the guests during the opening (artists, curators, exhibition spaces and the foundation …). This festive event will be an opportunity to strengthen cultural exchanges in this region of Europe. We would be extremely happy to see you on this day. With pieces of work by : Sara Bachour, Charlotte Beaudry, Pascal Bernier, Anne Büscher, Jacques Charlier, Alexandre Christiaens, Jerome Daly, Michael Dans, Alain Declercq, Messieurs Delmotte, Eric Deprez, Paul Devens, Michel François, Lara Gasparotto, Jean-Marie Gheerardijn, Myriam Hornard, Laurent Impeduglia, Djos Janssens, Eleni Kamma, Babis Kandilaptis, Charlotte Lagro, Sophie Langohr, Jacques Lizène, Sylvie Macías Díaz , Karine Marenne, Mon colonel & Spit, Michaël Nicolaï, Pol Pierart, Frédéric Platéus, Romina Remmo, Tanja Ritterbex, Marie Rosen, Charlotte vander Borght, Marc Wendelski, Aurélie William Levaux, Marie Zolamian. SAM ondersteunt het crowdfunding project Space Maastricht.